Realized in the clean, yet engaging narrative style that marked the most recent work of the Mascara/Santi directing duo ("Chris & Don"), "Monk with a Camera" is a documentary about one fundamental life assumption: people can change, if they want to. And nothing could deliver that statement as strongly as Nicholas Vreeland, the son of famed Vogue director Diana Vreeland and a perfectly introduced Manhattan socialite who decides to abandon metropolitan life to become none other than a Tibetan Buddhist. And beyond: becoming the abbot of the monastery that he has helped to renovate. A story that Mascara and Santi seem to have willingly chosen to report without indulging in mere controversy (something that it would have been so easy and obvious to achieve given Vreeland's prior life as a photographer and socialite), but rather observing from a distance this remarkable experiment in deeply reconsidering one's own essence. 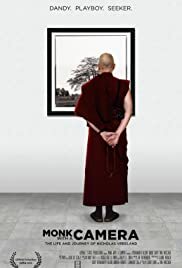 Beyond what could have been perhaps just another expected, almost obvious, exaltation of Buddhist philosophy's impulse towards achieving inner spiritual balance through change, this unpretentious, yet very coherent documentary ends up leaving you inspired (and perhaps even reassured) from a much broader point of view, Buddhist or not.